1.Dual LED light, 24 pcs 5000 hours lifetime LED beads, meet well to different customers requirment doing hands and feet nail art. 2.Two time setting 30s and 60s you can choose for different polish purpose. 3.LED beads instead of UV tube, avoid potential hazards of element mercury, non-harmful to your body. 4.The countdown shows clearly with the display window which makes your manicure and pedicure better on time control. 5.For curing fingernail or toenail and with automatic sensor, Let’s enjoy nail art at anytime and anywhere! Product description: 1.Dual LED light, 24 pcs 5000 hours lifetime LED beads, meet well to different customers requirment doing hands and feet nail art. 2.Two time setting 30s and 60s you can choose for different polish purpose. 3.LED beads instead of UV tube, avoid potential hazards of element mercury, non-harmful to your body. 4.The countdown shows clearly with the display window which makes your manicure and pedicure better on time control. 5.For curing fingernail or toenail and with automatic sensor, Let’s enjoy nail art at anytime and anywhere! 【Widely Used】It can cure almost all nail gels, such as CND Shellac, UV therapy gel, hard builder gel, extended gel, sculpture gel, gem glue, LED nail polish gel etc. 【Quicker Dryer】Quickly dry your finger and toe nails, via 48W high wattage and 24 LED beads, 180°no blind spots curing, more thoroughly and quicker than other low wattage nail lamps. 【Auto-Sensing】The uv lamp has a auto sensor. Hands in, lamp on. Hands out, lamp off. And 2 timer setting, 30s and 60s. The dryer machine will servie with full power at 30s and 60s model. 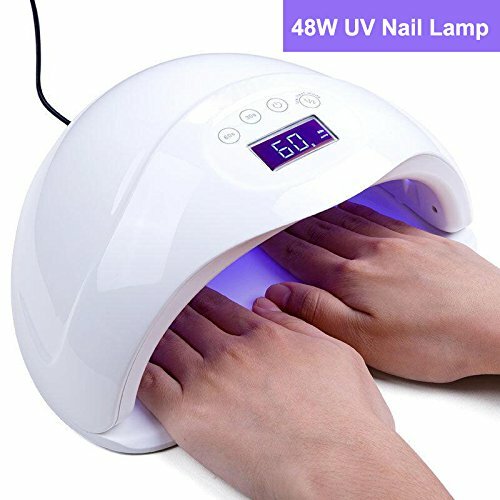 【Portable】Designed for hands and feet, manicures and pedicures,and light weight, it is good nail lamp for home, school, office and travel. 【Gift Idea】Beautiful curves design makes the nail dryer as a perfect gift for family and friends.